Netflix released a new trailer for 'Iron Fist' starring Finn Jones as Danny Rand, the heir to a billion dollar conglomerate, who returns from years of mystical martial arts training to regain his place in society and eventually join the Defenders. If you're a long-time fan of the Marvel character you'll be happy to see Danny's origins remain mostly intact. If you were hoping that Marvel would inject some diversity and course-correct Danny as an Asian-American you'll be immensely disappointed. Still, the trailer features Rosario Dawson as Claire Temple, the mainstay of the Netflix/Marvel universe, and Jessica Henwick as Danny’s companion Colleen Wing. Fifteen years after being presumed dead in a plane crash, Danny Rand (Finn Jones) mysteriously returns to New York City determined to reclaim his birthright and family company. However, when a long-destined enemy rises in New York, this living weapon is forced to choose between his family’s legacy and his duties as the Iron Fist. 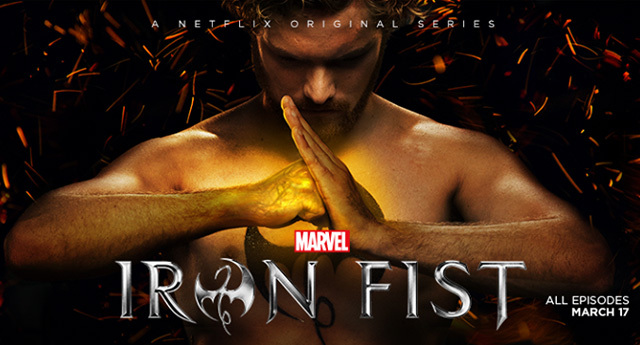 Marvel’s Iron Fist premieres March 17, 2017, exclusively on Netflix. 'Iron Fist' is the last show before they all assemble as the 'Defenders' team-up series. Daredevil, Jessica Jones, and Luke Cage have already made their mark on the streaming service, creating a more adult gritty world than Marvel's broadcast TV shows or even the feature films. What do you think of 'Iron Fist' so far from the action-packed trailer?